We believe that when little ones are happy on the inside, they're happy on the outside too. When it comes to looking after them, support, care & nutrition all help. IMPORTANT NOTICE: Cow & Gate follow-on milk is only for babies over 6 months, as part of a mixed diet. It should not be used as a breastmilk substitute before 6 months. 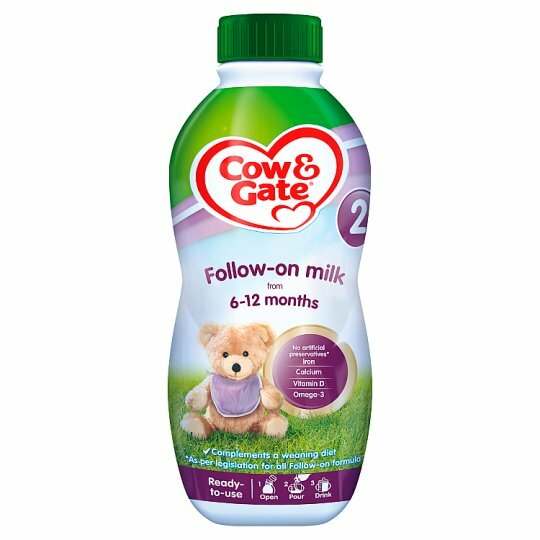 We advise that Cow & Gate follow-on milk should be used on the advice of a doctor, midwife, health visitor, public health nurse, dietitian, pharmacist, or other professional responsible for maternal and child care, based on baby's individual needs. Before opening, store in a cool, dry place., Once opened, unused follow-on milk in this 1 litre bottle must be refrigerated immediately and used within 48 hours., Best Before: see bottle neck., Packaged in a protective atmosphere. Quality guarantee: This product should reach you in perfect condition. If it is not satisfactory, please contact us. This guarantee does not affect your statutory rights. 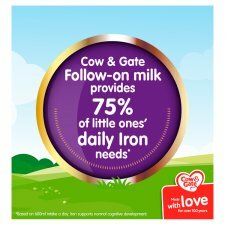 IMPORTANT NOTICE: Cow & Gate follow-on milk is only for babies over 6 months, as part of a mixed diet. It should not be used as a breastmilk substitute before 6 months. 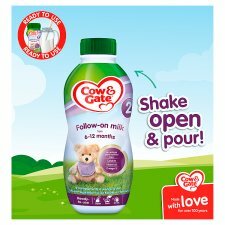 We advise that Cow & Gate follow-on milk should be used on the advice of a doctor, midwife, health visitor, public health nurse, dietitian, pharmacist, or other professional responsible for maternal and child care, based on baby's individual needs. Do not allow prolonged or frequent contact of milk feeds with your baby's teeth as this increases the risk of tooth decay. Ask your healthcare professional or dentist for advice. Make sure your baby's teeth are cleaned after the last feed at night. Never leave your baby alone during feeding.